While Jordan Peele has more than a few projects on the go, the beloved Get Out director reportedly is adding yet another — a remake of the classic '90s horror flick Candyman. According to a report from Bloody Disgusting, Peele is in talks to reimagine the 1992 film, which was originally directed by Bernard Rose and based on a story by horror king Clive Barker. At this point, details of the remake are beyond thin, however, with Bloody Disgusting reporting only that "Jordan Peele is in talks to produce a remake of the film through his Monkeypaw Productions." It's also unclear whether Peele would be directing the remake himself or simply producing the film. 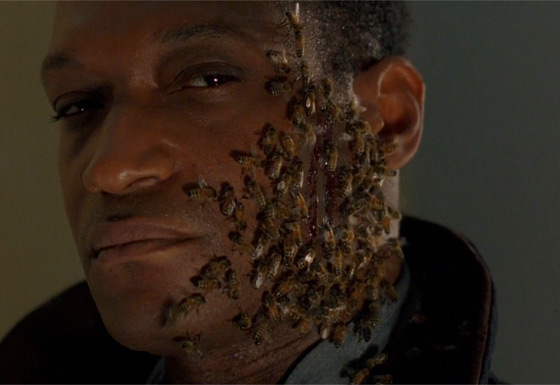 To refresh your memory, the seriously terrifying Candyman featured its titular character — played by Tony Todd — who was an artist and the son of a slave who had his hand severed and was then murdered with bees by his lover's father. To summon the Candyman, you had to say his name five times while looking into a mirror — a ritual then repeated IRL at countless '90s sleepovers. For now, stay tuned for any news on the possible Candyman remake.